One person's pro is another's con. I've seen Notebook lose stars because it doesn't allow you to set the colour of text. But I've long been looking for a sticky note alternative that *doesn't* do rich text, ie allows me to copy / paste in and out as plain text. The very long-standing Stickies app is unbelievably still here in High Sierra, unchanged for decades. But those have long worked using rich text. 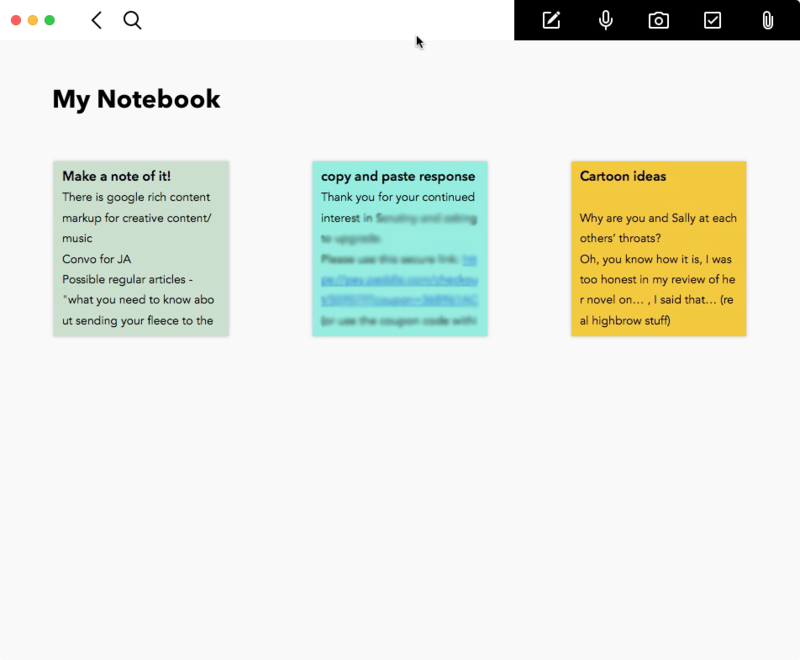 Initially it appeared that Notebook's text cards are plain text, but after some use I found that they're not plain-text - but not rich-text either. More of that later. What does it offer over and above the tools that come with the OS? Bizarrely I can almost create the look and functionality that I want using TextEdit - it allows me to create square plain text documents and set the background colour of each. Unfortunately it doesn't remember those background colours after quit and restart. MacOS's Notes app scores highly for its syncing across devices (with some frequent annoying duplication). It's the app I have been using when I need to paste something or note down a thought when my phone is in my hand, and later retrieve on the computer. It allows you to organise things in a pretty basic way. Reminders is as per Notes but for lists. Slightly annoying having to open both those system apps to have text and lists at my fingertips. Notebook combines text / lists / images / voice and file attachments (why only certain file types?) It has good visual cues (custom covers on the notebooks and coloured background to the text cards). Notebook does the syncying across devices, but only by creating an account with Zoho. iCloud-enabling would make a 9/10 into full marks for this part. Without a doubt Evernote. This is made clear by the File > Import from Evernote option. Personally I didn't get past EN's start screen because it didn't seem to want to let me continue without creating an account. Cost / if free - how are you paying?